Can you provide more information about your qiime2 installation, the steps you took to try to install the plugin, and any outputs or errors that you get? Otherwise, I don’t have enough information to help you. Thanks! Below are screen shots of the steps I took. 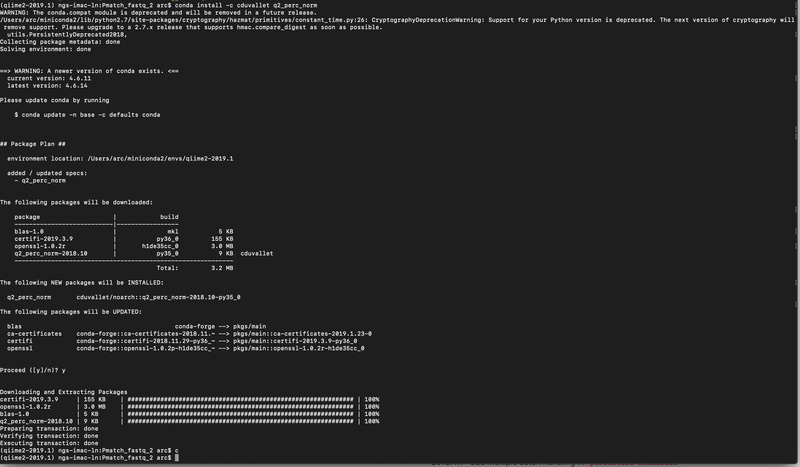 I think I know whats going on, although I’m surprised conda didn’t error. 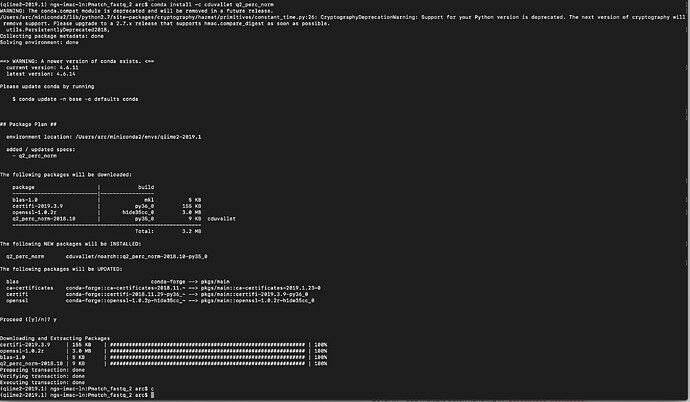 What I think may have happened is the conda build for q2-perc-norm uses Python 3.5. As of 2019.1 we switched to Python 3.6, this means existing conda packages should be rebuilt for 3.6 (or built as no-arch). If the source installation doesn’t work, then something much stranger is happening. which is meaningless to a 3.6 environment (which uses /lib/python3.6/site-packages). Good news is a source install seems to work fine! Thanks, @ebolyen! Yep, I hadn’t updated my package since everything switched to Python 3.6. I just re-built the package with Python 3.6 and uploaded it to anaconda, so you should be able to update the package with conda directly and everything will work as expected.